Nokia mobile phone manufacturing company has released another version of OTA update for its smart device called Nokia 6. 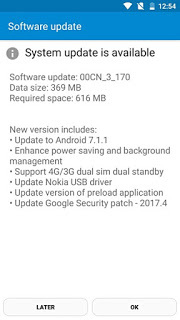 So in notice of that, users of Nokia 6 smartphones should be upgrading/updating their mobile phone with the latest version of Android Nougat 7.1.1 that supersedes the previous version Android 7 Nougat which the phone came with when launched 2 months ago. 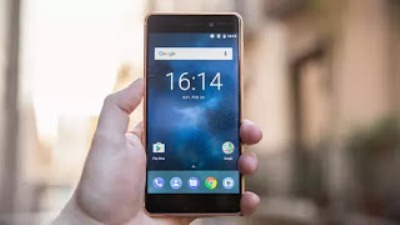 As you may know, the Nokia 6 Smartphones, all have started receiving the latest OTA update for Android Nougat v7.1.1 and the size is about 370MB. The update is actually coming out with the latest security patch feature, and many other nice changes which you may like when you must have upgraded. ==> Infinix Users Can Get The Official Android 7 Nougat Update For Infinix Note 3 and Note 3 Pro X601 Here. Hope you know that, Nokia 6 is actually the first Android smartphone that Nokia Company came up with before others. The device was launched at the MWC just earlier this year, 2017. Some of its features and specifications include; 16MP rear camera, which is the back camera and 8MP for the front camera. It is featuring a 5.5-inch in-cell full HD display which is protected with 2.5D Gorilla Glass. The device is powered by Qualcomm Snapdragon 430 processor with X6 LTE modem, embedded with a paired 4GB of RAM and 64GB ROM (internal memory). The whooping battery capacity is 3000mAh and many more nice features. Came with, updates on Nokia USB driver and version of preload application. The OTA update change-log also came with improved power saving features that makes your battery last longer. HOW TO INSTALL OR UPGRADE TO THE LATEST ANDROID NOUGAT V7.1.1 FOR NOKIA 6 DEVICES. The update is actually a simple one that all can do without much stress, as it’s Over The Air (OTA) update. Now un order to upgrade your Nokia Android, just navigate to your phone’s settings, and go to where you see "about phone", click on system updates and what you will see is the new update ready to be updated. Note: Before undergoing the process of updating your phone, ensure your battery is fully charged or at least 90%. And also ensure you have about 1GB worth of data on your SIM which will be used to connect to the internet while updating. So if you have all these in place, then go ahead and click the download from system update you clicked earlier and then install the new version. Remember, after the installation process, your Nokia phone will reboot by its self and then, the new update will be installed successfully.